In a series of revealing interviews, Bill Griffeth, the host of CNBC's acclaimed Mutual Fund Investor, elicits the philosophies, strategies, and formative experiences of 20 of today's most successful and most popular fund managers. Extremely intelligent and staunchly individualistic, the mutual fund masters utilize a variety of approaches to beat the market. Some invest stock by stock, while others seek to profit from sweeping sociological or economic themes. Some are extremely conservative, while others embrace risk. Despite their differences, the mutual fund masters share two important things in common. Number one, they all love what they do. Secondly, the mutual fund masters have consistently outperformed the markets for years. In so doing, the masters have helped millions of people to build wealth and achieve lasting financial success. Some of the top managers featured in the book include: Peter Lynch: Probably the most successful mutual fund manager of all time; J. Mark Mobius: The dean of all emerging market mutual fund managers; Eric Ryback: The man who went from a wilderness guide to manager of two top funds; William Gross; The best-known fixed income manager in the U.S.; Kenneth Heebner: Known as the "mad bomber" for his investment style; Ralph Wanger: The "King" of small cap fund managers; John Neff: The legendary manager of the $11 billion Vanguard Windsor Fund; Grace Pineda: Manager of one of today's hottest emerging market funds; James Benham: The originator of money market mutual funds and Philip Carret: A founding father of the mutual fund industry. Entertaining and easy-to-read, The Mutual Fund Masters will provide you with dozens of insights and techniques to help you better select mutual funds. The masters share their "war stories," as well as their opinions on the dangers of derivatives and the astonishing growth of the mutual fund industry. Above all else, The Mutual Fund Masters takes you inside the minds of the world's top investors and shows you how they go about finding tomorrow's investment opportunities. With the explosive growth in mutual funds, top mutual fund portfolio managers are the new superstars of Wall Street. 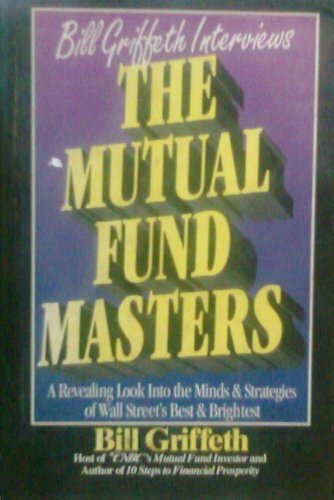 Quite simply, no other book captures the personalities, opinions, and investing insights of these superstars as well as The Mutual Fund Masters. If you have any questions about this product by Probus Publishing, contact us by completing and submitting the form below. If you are looking for a specif part number, please include it with your message.